Can Metal Bowls Touch Your Soul? 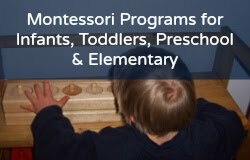 I visited a Montessori school to observe their toddler classroom for my son, when he was a tot. I loved it: the environment was spacious, lots of light, many lovely activities, little wooden stools and low tables, a painting easel, green plants, and a hamster; what one would expect in a toddler Montessori class. It was time to go outside and see the playground, and it was for toddlers only (they played separate from the preschoolers--another plus!). I looked around the corner and saw rows of metal bowls stuck to a red and yellow painted board. "What on earth is that?" I asked the teacher. The toddler teacher explained: "The kids used to bang their little plastic hammers on the building, and I thought, if they want to bang, let's give them something to bang on!" She contacted a local environmental sculpture artist friend, and he made them a bowl sculpture! But wait... If this a Montessori environment, shouldn't they be in order of largest to smallest or something--if you look again at the picture, they look all out of order (and you are probably wondering why). The artist ordered the metal bowls on the board according to their musical scale! I was so touched by this I was ready to start by son the very next day! This teacher (with over 30 years experience BTW) was able to observe the behavior of her tots, and find a better solution to their need to bang; and who would think of screwing rows of metal bowls on a board, in order of their musical sound! It truly melted my soul!